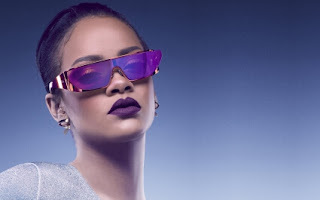 Singer Rihanna shines bright like diamonds, and it seems anything she touches turns to gold. Riri's impressive fashion and style this year, set the trend for most clothing buyers worldwide. This is according to fashion search platform Lyst. The girl is on fire and the flames never went out for the whole year, as she dazzled in outfits that got the world talking—outfits that made people want to dress that way. Her consistent excellence paid off. Now the 29-year-old singer, actress and make-up entrepreneur has officially been named the most powerful celebrity influencer of the year. All thanks to her gorgeous style which drove huge sales for fashion brands. It's not just what she wears, it's how she wears it. Throughout the year Rihanna has donned designs by Molly Goddard, Gucci, Saint Laurent and even Puma . And in turn, all of these brands have been snapped up by her frenzied fans. The clothes flew off shelved once she was spotted wearing them. According to data analysis, out of 100 million searches by 80million shoppers worldwide on Lyst's search, Rihanna's outfits have caused the most sensation amongst buyers. Her outfits have sparked the most frenzy amongst shoppers. Her golden touch even extended to her own designer eyewear. It is now clear that anything the beautiful singer wears, people want to wear it too. Her influence this year is so great, she put the Duchess of Cambridge Kate Middleton(a fashion goddess herself) in the shade. In fact, the stylish Duchess only just made it into Lyst's top five most influential fashion celebrities behind Rihanna, and other stars. Surprisingly her new royal rival, Meghan Markle also made the list. Lyst's end-of-year fashion report, listed the most influential stars. The decider is based on huge spikes in demand in the hours after a particular item is worn by a particular Celebrity. This year Rihanna was also the fashion queen of social media since she donned some of Instagram's most popular items of the year as well. Back in April, while attending Coachella, the 'Work' hitmaker turned heads when she showed up wearing a crystal-embellished Gucci bodysuit and vest that was inked with a the memorable phrase. More recently,The stunning Barbadian beauty favoured a pair of Gucci's luxe crystal socks. And yes in case you ever want to buy those, that retail for £885! Yes Riri tops the list. And with her newly acquired curves She tends to look even hotter in her outfits. She has released collections with Top designers Puma and Dior, and has often been spotted wearing her own designs which have also become sell-outs. After its release, One of her popular designs; the Fenty x Puma bow trainer became the most-wanted it-trainer of the year. Lyst reports that one person searched for the sellout shoe every few seconds! With no signs of slowing down, Rihanna continues to dazzle the world of fashion with her own incredible Celebrity sense of style.